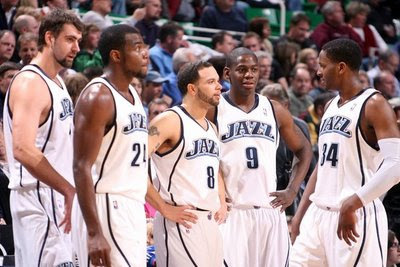 We all know the Jazz have been playing some damn (excuse me, dang) good ball lately. A lot of people are asking why. Is it because Boozer is out? Sundiata Gaines is on the team? Or is it that Wes Matthews' locker is now next to AK's, and they've been inspiring each other to hustle all over both ends of the court? We may never know. And to some extent it doesn't matter as long as Jerry has figured out the rotation and we keep getting Ws. The more interesting question is, how good are we? According to EPSN, our boys have actually played the second most difficult NBA schedule of any team so far this season. They also rate us as the second best team in the league, behind only Cleveland. Unfortunately, although this may be mathematically accurate in some sense, I'm not sure it fully accounts for how much better we are at home than on the road or our penchant for losing to teams we should beat by 40. It doesn't bode well that as of today we've played six more games away from the Tox Box than in it and still have to go to battle with the mighty T-Wolves once more this season. It's certainly encouraging that we've been winning without Boozer and it seems like -- for reasons that certainly no one understands -- Kirilinko is a legimate third offensive weapon in the starting lineup again. Even better, we're only a half game behind Dallas for the 3 spot in the West. But color me cautious. We're two weeks away from the trade deadline and are looking to make some kind of move, which may be major. With all these road games coming up, something also tells me we're headed for some uncalled for losses. Come on Jazz, prove me wrong. . .